[En] Vince Benedetti Hardbop World is structured in the classical quintet format and consists of four Benedetti colleagues from the region of Granada, where he now lives. Features the bandleader’s wonderful original compositions–along with two pieces from Barry Harris and Wes Montgomery–whose melodic, rhythmic, and harmonic decisiveness seamlessly connect to the classics from the golden age of hardbop of the late ’50s and early ’60s. Well known for his early recording with jazz chanteuse Diana Krall, Benedetti has worked with a « who’s who » of the music world including such illustrious names as Stan Getz, Dexter Gordon, Chet Baker, Roy Eldridge, Slide Hampton, Ann Malcolm, and Archie Shepp. Most of the major European radio bands and orchestras have performed his arrangements and original compositions. 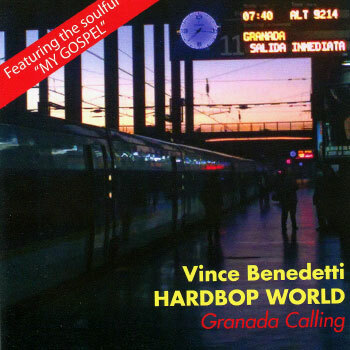 La description de l’album Granada Calling de Vince Benedetti and Hardbop World n’est pas disponible actuellement. Commentez cet album et gagnez des cartes de téléchargement gratuit et/ou des Ipods Apple.